An American Airlines Boeing 767-300ER sustained substantial damage after experiencing an uncontained engine failure during takeoff at Chicago-O'Hare International Airport, IL. Flight AA383 to Miami International Airport in Florida was cleared for takeoff from runway 28R via the N5 taxiway. This intersection is located 1120 m past the runway threshold with 2800 m runway remaining. About 14:31 hours local time the captain lined up for takeoff, advanced the engines to takeoff power, and the engines achieved full takeoff command 10 seconds later. The crew had a calculated takeoff decision speed (V1) of 134 knots for the takeoff. The captain was the pilot flying and the first officer was the pilot monitoring. According to the captain and first officer, about 2 to 3 seconds after the first officer's 80 knot call, they both heard a "ka-boom" sound and the airplane veered to the right. The captain estimated that they were about 110 knots when he initiated the rejected takeoff. Flight Data Recorder information indicated that the airplane reached a maximum recorded airspeed of 136 knots. The airplane was equipped with a rejected takeoff braking system and the captain described the performance of the system as an "aggressive stop." During the rejected takeoff the first officer announced to air traffic control (ATC) that they were stopping, at which time the controller acknowledged and reported there was a fire. After the airplane came to a stop, the crew received the first indication of a fire in the right engine when the fire light illuminated with the fire bell. The captain commanded the engine fire checklist, which included five memory items. During the operation of the checklist, the captain shut off the fuel switch for the right engine and the first officer pulled the right fire T-handle and then rotated the handle in order to discharge one of the fire bottles into the right engine. Subsequently, they began the evacuation checklist. The first officer went through each item of the evacuation checklist and the captain accomplished the items. The captain further stated that a large portion of the evacuation checklist was to depressurize the airplane; and he felt that it took a long time to depressurize. During that time, the left engine remained at idle power and he could audibly observe a commotion in the cabin. Once they were at the point in the checklist to shut down the left engine, he secured the left engine, made an announcement over the public address system to the cabin to evacuate, activated the evacuation alarm switch, completed the evacuation checklist, and exited the cockpit, at which time they observed "a lot of smoke." During the time from the airplane coming to a stop and the right engine being shutdown the flight attendants had begun the evacuation. Flight data recorder (FDR) information showed that between 8 and 12 seconds after the airplane came to a stop the left overwing exit door opened, followed approximately 17 seconds later by the forward left door and then approximately 4 seconds later by the forward right door. The FDR stopped recording approximately 58 seconds after the airplane came to a stop. After exiting the cockpit, the pilots were met by the lead flight attendant who informed them that the airplane had been evacuated and that everyone was off the airplane. The first officer exited via the 1L slide, followed by the flight attendant, and then the captain. Once they were on the ground the flight crew stated that the flight attendants were moving the passengers away from the airplane. Once the airport rescue and firefighting (ARFF) personnel arrived the captain contacted their dispatcher and requested a total number of souls on board. All of the occupants and crew evacuated the airplane through various exits and slides. During the evacuation, one passenger received serious injuries and 19 passengers received minor injuries. Preliminary investigation results show that the right hand engine's stage 2 high pressure turbine disk fractured into at least 4 pieces. One piece went through the inboard section of the right wing, over the fuselage and into a UPS warehouse facility, 900 metres south of the runway. As a result of the uncontained engine failure, a fuel leak resulted in a pool fire under the right wing. Investigation showed that one of the fractures exhibited features consistent with fatigue cracking initiating at an internal inclusion near the forward side of the hub’s inner bore. The disk had 10,984 cycles and had a life limit of 15,000 cycles. tank, releasing fuel that resulted in a fire on the right side of the airplane during the takeoff roll. The HPT stage 2 disk failed because of low-cycle fatigue cracks that initiated from an internal subsurface manufacturing anomaly that was most likely not detectable during production inspections and subsequent in-service inspections using the procedures in place. Contributing to the serious passenger injury was (1) the delay in shutting down the left engine and (2) a flight attendant’s deviation from company procedures, which resulted in passengers evacuating from the left overwing exit while the left engine was still operating. Contributing to the delay in shutting down the left engine was (1) the lack of a separate checklist procedure for Boeing 767 airplanes that specifically addressed engine fires on the ground and (2) the lack of communication between the flight and cabin crews after the airplane came to a stop. Work with operators as required to develop and/or revise emergency checklist procedures for an engine fire on the ground to expeditiously address the fire hazard without unnecessarily delaying an evacuation. For all airplanes that you operate, review existing engine fire checklists and make changes as necessary to ensure that the procedures would expeditiously address engine fires occurring on the ground without unnecessarily delaying an evacuation. Establish and lead an industry group that evaluates current and enhanced inspection technologies regarding their appropriateness and effectiveness for applications using nickel alloys, and use the results of this evaluation to issue guidance pertaining to the inspection process for nickel alloy rotating engine components. Require subsurface in-service inspection techniques, such as ultrasonic inspections, for critical high-energy, life-limited rotating parts for all engines. Revise Advisory Circular (AC) 20-128A, "Design Considerations for Minimizing Hazards Caused by Uncontained Turbine Engine and Auxiliary Power Unit Rotor Failure," based on an analysis of uncontained engine failure data since the time that the AC was issued, to minimize hazards to an airplane and its occupants if an uncontained engine failure were to occur. The revised AC should include modifications to the accepted design precautions for fuel tanks given the fires that have occurred after uncontained engine failures. 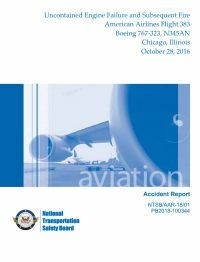 When approving the operating procedures of a 14 Code of Federal Regulations Part 121 air carrier, require operators to develop and/or revise emergency checklist procedures for an engine fire on the ground to expeditiously address the fire hazard without unnecessarily delaying an evacuation. Develop and issue guidance to all air carriers that conduct passenger-carrying operations under 14 Code of Federal Regulations Part 121 regarding (1) discussing this accident during recurrent flight attendant training to emphasize the importance of effectively assessing door and overwing exits during an unusual or emergency situation and (2) providing techniques for identifying conditions that would preclude opening exits, including an operating engine. Review the training programs of all 14 Code of Federal Regulations Part 121 operators and make changes as necessary to ensure that the programs provide flight attendants and flight crews with training aids and hands-on emergency scenarios that account for the different interphone systems that air carriers operate. Conduct research to (1) measure and evaluate the effects of carry-on baggage on passenger deplaning times and safety during an emergency evacuation and (2) identify effective countermeasures to reduce any determined risks, and implement the countermeasures. Perform an ultrasonic inspection (UI) for cracks in HPT stage 1 and stage 2 disks on the CF6-80C2 turbofan engine and in HPT stage 2 disks on the CF6-80A turbofan engine at each piece-part level exposure in accordance with the Accomplishment Instructions, paragraph 3.A. (2), in GE CF6-80C2 SB 72-1562 R03, dated January 10, 2018, or the Accomplishment Instructions, paragraph 3.A. (2) in GE CF6-80A SB 72-0869 R01, dated October 19, 2017, as applicable to the engine model.